, a learned physician, was born at Nieder Wesel, in the duchy of Cleves, Oct. 30, 1581 but his relations being compelled, by the troubles of the times, to retire to Osnaburg, he began his classical studies there. 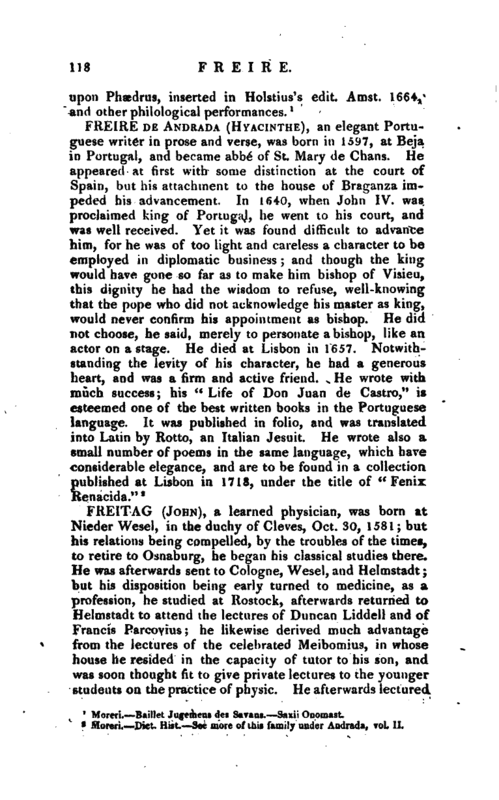 He was afterwards sent to Cologne, Wesel, and Helmstadt; but his disposition being early turned to medicine, as a profession, he studied at Rostock, afterwards returned to Helmstadt to attend the lectures of Duncan Liddell and of Francis Parcovius; he likewise derived much advantage from the lectures of the celebrated Meibomius, in whose house he resided in the capacity of tutor to his son, and was soon thought fit to give private lectures to the younger students on the practice of physic. He afterwards lectured | in public as professor extraordinary; and in 1604, at the age of twenty-three, he obtained the ordinary professorship in the university, which office he filled during four years. He then took his degree of doctor, and went to the court of Philip Sigismund, duke of Brunswick Lunenburg, and bishop of Osnaburg, who had appointed him his principal physician. About 1622, Ernest, duke of Holstein and earl of Schawenburg, offered him the same office, with the addition of the chief medical professorship in the university which he had lately founded at Rinteln; but his patron would not permit him. to accept it. 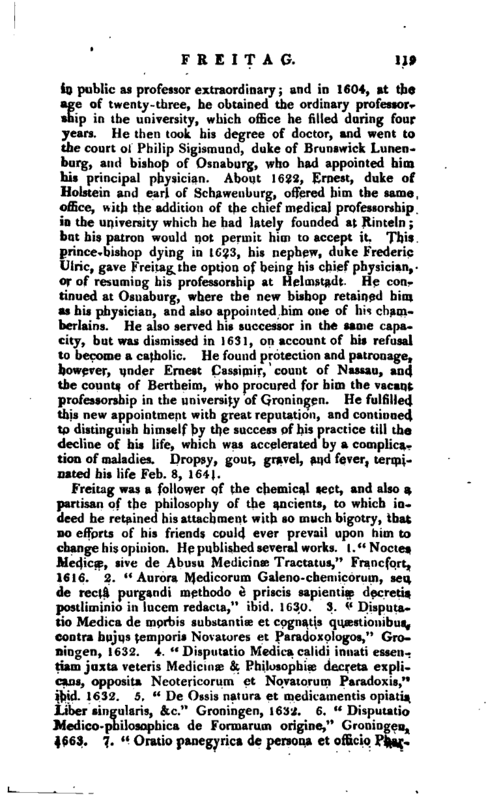 This prince-bishop dying in 1623, his nephew, duke Frederic Ulric, gave Freitag the option of being his chief physician, or of resuming his professorship at Helmstadt. He con*­tinued at Osnaburg, where the new bishop retained him as his physician, and also appointed him one of his chamberlains. He also served his successor in the same capacity, but was dismissed in 1631, on account of his refusal to become a catholic. He found protection and patronage, however, under Ernest Cassimir, count of Nassau, and. the counts of Bettheim, who procured for him the vacant professorship in the university of Groningen. 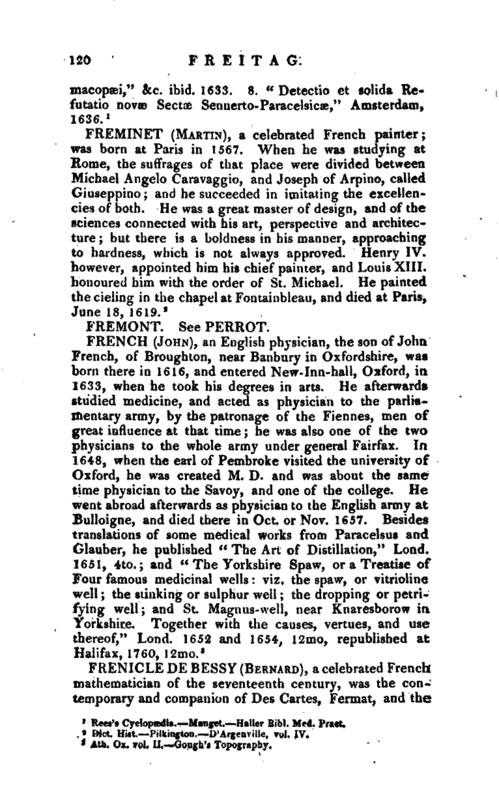 He fulfilled this new appointment with great reputation, and continued to distinguish himself by the success of his practice till the decline of his life, which was accelerated by a complication of maladies. Dropsy, gout, gravel, aud fever, terminated his life Feb. 8, 1641. Rees’s Cyclopædia.—Manget.—Haller Bibl. Med. Pract.